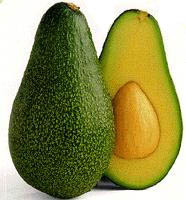 Take one avocado's flesh, 2 teaspoons of honey, 1 teaspoon of birch sugar (or 2 tsp of brown sugar to get a skin scrub). If you have oily skin, add half a lemon's juice in it too. Apply it onto your skin, leave it up for 10-15 minutes then wash it off with lukewarm water. Take half an avocado's flesh, add a teaspoon of grape seed oil to it and mix it well. Apply the mixture onto your skin, around your eyes and mouth. Leave it up for 10 minutes, then wash it off with lukewarm water. To restore your hair's health, take one avocados flesh and mix it with one egg (you can leave the yolk, if you want to). Apply this mask onto your hair, after hair wash, leave it up for 10 minutes, then wash it off.